I just spent a few days with friends and some family at Lake Itasca State Park. Surrounded by trees, lakes and of course, the headwaters of the Mississippi River, it is truly a beautiful place. 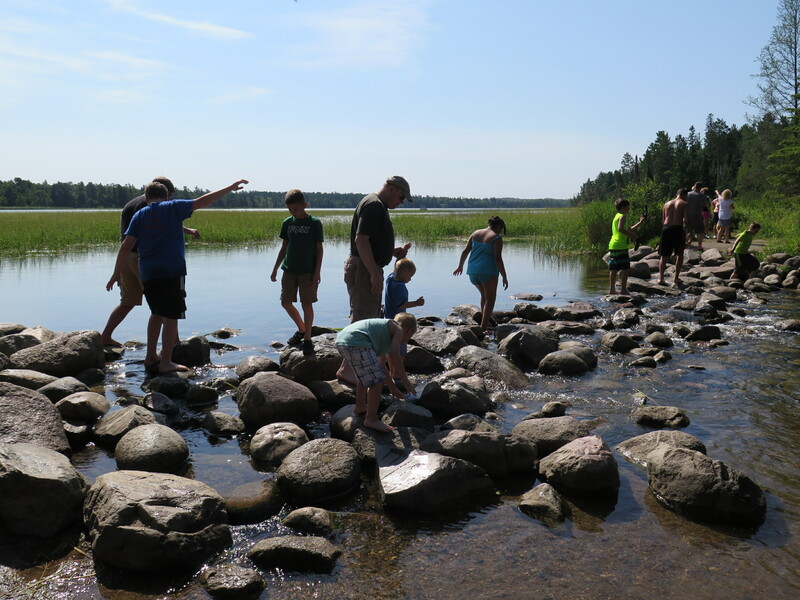 Here a small stream, coming out of Lake Itasca, makes its way through ten states on its way to the Gulf of Mexico. At the headwaters, people of all sizes walk across the Mississippi on rocks. Down river, some of my family is planted along the Mississippi’s path. When I looked at that small creek, I thought of how the water would flow past Minnesota’s Twin Cities where I live, and on down to Winona where my daughter’s family lives now. The water continues to run past another daughter and her family in La Crosse Wisconsin as it continues to move towards the gulf. I wonder at the reality that something so small can become so mighty. By the time it reaches the homes of my daughters the Mississippi has widened and deepened. River boats and barges work the river. Yet, the water which is moved by mighty currents, had it’s start where I stood. I’ve felt a pull to the river since I first drove along Hwy 61. With eagles soaring overhead and the crisp blue sky reflecting on the water, I am enamored by the Mississippi’s beauty. Through seasons of spring green and autumn colors, I marvel and revel in its contrast. In winter, there is a place of open water where the Chippewa River merges into the Mississippi. Even on sub zero days, eagles can feed and find shelter. I’m reminded of God’s providence and care. The psalmist says of God: “Even the sparrow finds a home, and the swallow a nest for herself, where she may lay her young.” Psalm 84:3. God’s providence includes all of creation – even us. Some days I need to be reminded of this truth. This entry was posted in Christian, Faith, Faith & Life and tagged Faith & Life, God's care, God's providence, Lake Itasca, Lake Itasca State Park, Mississippi, Mississippi Headwaters, MIssissippi River, Psalm 84:3, the Mississippi. Bookmark the permalink.